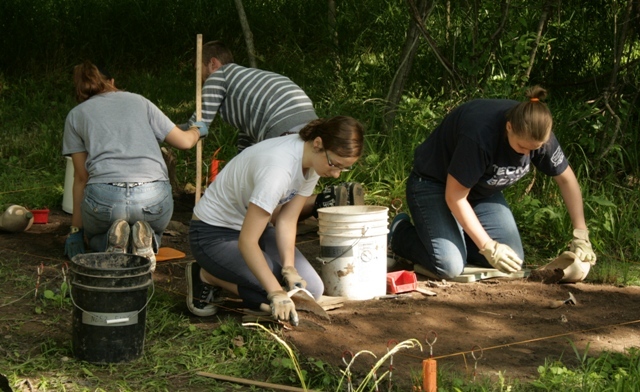 The following was prepared by the students participating in the excavations at the Johnson’s Island Civil War Prison site this summer as part of the Heidelberg University Archaeological Field School. Since they are excavating within the former location of Block 8, they have decided to present some historical information on life in the block during its time as a prison. 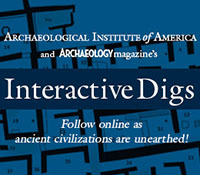 However, the pictures reflect the student’s experience recovering the archaeological evidence. The basic day in Block 8 on Johnson’s Island went as follows. Prisoners woke up around six for breakfast consisting of coffee, bread, and beef (fried or boiled). There was no leaving the quarters until the garrison raised the flag (which was a little after sunrise). This was followed by roll call and count was taken. No Confederate ranks were recognized in roll call. After breakfast, the ice man and milk man came into the prison and the sutler would sell (at fixed prices) vegetables, clothes, and newspapers like the Sandusky Register, days-old copies of the New York Herald, and the Cincinnati Enquirer (which was later banned because of secessionist attitudes). Other items sold were fruits, butter, writing paper, tobacco, smoking pipes, shaving equipment, and other personal items. Clothes, however, were very limited; the official limits on clothing were one suit of clothes, no boots and only shoes of poor quality, and in winter coats were available. The sutler operations were halted several times in retaliation for how federal troops were treated in Southern prison camps. Water could be gathered from either of the two pumps located in the camp. Otherwise, when the pumps were either broken or frozen in winter, it was gathered from the lake. Early in the war, other services located in the camp were a bakery, lemonade, pastry shop, and even a brewery. Also available were tailors, cobblers (shoemakers), laundry services (5cents a garment), artists, a circulating library begun in 1864, barbers, a minstrel show, and jewelers. Lt. William Peel was one of the Confederate officers imprisoned at Johnson’s Island. He kept a diary during his stay, and it was later published. In his entries he wrote about his time in Block 8, where he stayed and slept. Block 8 held many religious services and payer services for prisoners. He also mentioned supplementing his meals with rats to help ease his suffering from hunger. Along with meals and religion, Peel also described the addition of stoves and other changes among the various blocks. Block 8 was also “home” to the infamous Lt. Charles Pierce of the 7th Louisiana, who made many escape attempts in his time on Johnson’s Island. An attempt was made to tunnel from Block 8 to the wall, but escape endeavors were shifted to the more ideal location of Block 1. This summer, our excavations are focused on Block 8 and a latrine used by prisoners there in 1862-1863. Stay tuned for more updates! This entry was posted on Thursday, June 16, 2011 at 3:47 pm	and is filed under Field Reports, From the Students. You can follow any responses to this entry through the RSS 2.0 feed. Both comments and pings are currently closed. This is great. Keep sending me the results. Great job everybody. How wonderful to be an archeologist. I have been a dept secretary at a Scottish university for 30 years. Dept of education. Love the environments. But if I lived again I wld join you. Great job! I’m only sorry I’m too old and lack the mobility to visit. I’d love to be able to assist. I look forward to your reports. Thanks so much.